Julia was the only child of Augustus and his first wife, Scribonia. She was born in 39 BC and initially was the source of great enjoyment and pride to her father. After a fairly normal childhood, Julia was married toMarcus Claudius Marcellus in 25 BC. Unfortunately, Marcellus died two years later in 23 BC. Augustus then married her for political purposes to his good friend Agrippa in 21 BC with whom she bore five children – Gaius, Lucius, Agrippa Postumous, Julia the younger and the notable Agrippina, who would ultimately bare the future Emperor Caligula. Following the death of her second husband, Agrippa, Augustus once again married her off in 11 BC for political purposes but this time to the son of his wife Livia, the future Emperor Tiberius. While according to Seutonius, Julia had long been lusting after Tiberius, the feeling was not mutual. Tiberius was ordered to divorce his wife Vipsania, to whom he was truly devoted. The union turned from cold to outright hostile following the stillborn birth of a child at Aquileia. Tiberius refused to have anything to do with her and in 6 BC chose to retire to Rhodes. While Julia had a reputation for good humor and kindness, she also apparently had quite a lust for sexual exploits. Her adulteries were so numerous that hardly anyone in Rome was unaware of her new found reputation, with the exception of her father Augustus. Despite the widespread rumors, Augustus found it impossible to believe that his daughter would engage in such behaviour. Finally, in 2 BC, Augustus became convinced by an investigation which uncovered her affairs with quite a large group of men including tribunes and Julius Antonius, one of the sons of Marc Antony. Julia quickly found herself the center of one of the greatest scandals in Rome history, perhaps only second to that of Messalina, wife of Claudius. Augustus banished her to the island of Pandateria with her mother Scribonia. 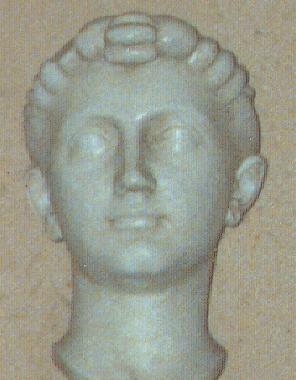 Julia managed to survive for several years until 3 AD when Augustus transferred her to Rhegium due to a public outcry. Augustus was so disappointed in her that he prescribed in his will that upon her death, she was not to be buried in his mausoleum. When Tiberius came to power, he put a stop to all comforts and gifts. She died of exhaustion and malnutrition in late 14 AD.